The Patriarch of the Russian Orthodox Church, Kirill I of Moscow, has slammed the Euromaidan protests in Ukraine, saying that they will “divide the nation”. In his reference to the “nation”, Kirill I did not specify whether he meant the Ukrainian nation, or whether he was referring to a wider concept of the “Russian nation” incorporating Ukraine. The official title of Kirill I is the Patriarch of Moscow and all Rus’, a concept that incorporates not only Russia but also part of Ukraine, including Kyiv. The Euromaidan protests in Ukraine began on November 21, with Ukrainians demanding greater European integration. Mass demonstrations in Kyiv were sparked by the Ukrainian government’s decision to halt preparations to sign an Association Agreement and Deep and Comprehensive Free Trade Agreement with the European Union. What is happening in Ukraine, hurts my heart a lot. Ukraine for me is my native country, it is my native people, it is my people and my flock. And what I’m doing now, is connected with my inner spiritual life. I pray for Ukraine, I pray for that nation. I understand that there is a threat of a divided nation. Threats of another round of civil confrontation. Generally what we see today is a revolutionary situation. This does not mean that I am appealing to them to reconsider their political viewpoints. After all, the Church has never associated itself with any particular geopolitical project. If this were so, there would be no Church. The Church bears the word of reconciliation, she turns to the human soul. She should help people in this difficult time to collect, focus and perhaps lay the groundwork for such a dialogue that would help solve the problems facing Ukraine today. 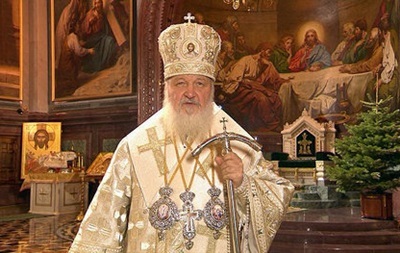 Kirill I, a native of St Petersburg, has caused controversy since his inauguration in 2009 over his standpoint on Russian and Ukrainian unity and the transnational character of the Russian Orthodox Church. The Ukrainian capital, Kyiv, is considered as the birthplace of both Ukrainian and Russian Orthodoxy, and of the Ukrainian and Russian nations; in 988, Prince Volodymyr (Vladimir in Russian) decided to adopt Orthodox Christianity from the Greeks. Both Russian and Ukrainian national identity narratives claim Volodymyr/Vladimir as their founding father, while Russia’s foundation myth attests that the natural successor of Kyivan-Rus’ was Vladimir-Suzdal, which eventually became part of the Grand Duchy of Moscow. Russian Orthodox Church leaders have strongly opposed any integration of either Russia or Ukraine into Europe, insisting that their unique character and history means they should stand apart. Archpriest Vsevolod Chaplin, who is close to Kirill and who has insisted that the term “Rus'” implies a spiritual connection between Russia and Ukraine, is another vocal opponent of European integration. In his own Christmas speech, Chaplin railed against the West, saying that the “Western social model” could not cope with today’s challenges and is characteristic only of a minority of the world’s population. “It is characteristic mainly for peacetime and is becoming more marginal, not being able to cope with formidable challenges of history,” he said. Many people are “learning to resist” the West, he added. PreviousSyria: Where In The World Is Abu Umar al-Shishani?